If you, like me, get too excited when dinner looks ready, you might also have a little collection of blisters and scars from grabbing the too-hot handle of a pot, pan or skillet. 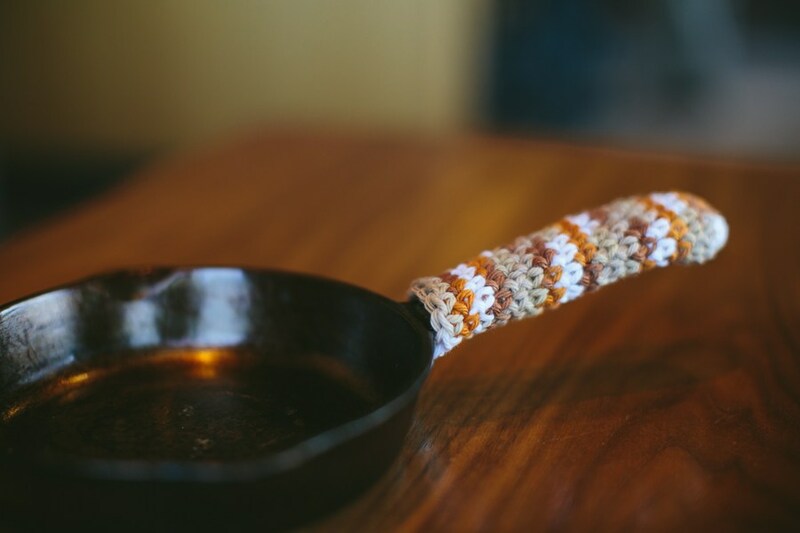 However, there is a simple solution: these adorable little crocheted pan handle holders! This is a great project for “stash-busting” when you need to use up yarn leftovers, and they can be made in any color of any yarn size or texture, though of course you’ll probably want to use something more durable and less flimsy, or pair the flimsy with something stronger. Cotton is always a safe choice. You could make these with lines and stripes, variegated yarns, or with complimentary colors to match your potholders. Rene’ Catron’s free panhandle crochet pattern calls for cotton yarn and a 4.25mm crochet hook, along with knowledge of the following stitches: chain (ch), single crochet (sc), half double crochet (hdc), and decrease (sc2tog). There’s a small size and a large size for you to use, as well, along with some excellent photos. This pattern has a nice edging to the handle holder, which provides a thicker shield between the hot handle and your fingers. 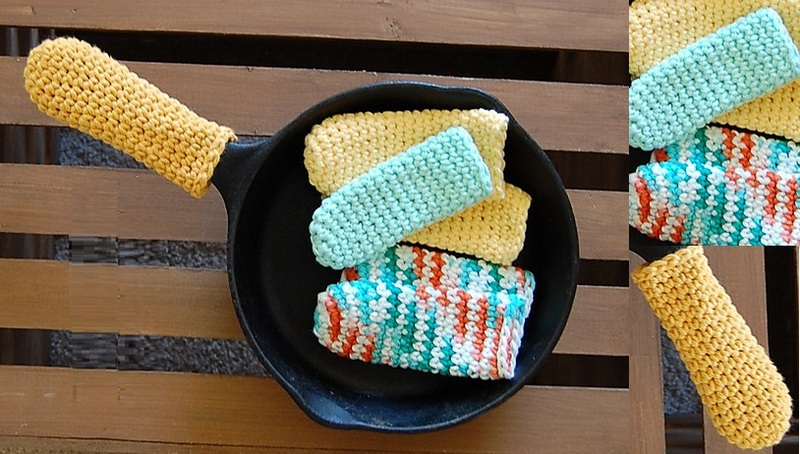 She’s Crafty Crochet also has a free crochet pattern for cast iron handle covers, which uses worsted-weight cotton yarn and a 4mm crochet hook, along with these stitches: chain (ch) and single crochet (sc). If you use Lily Sugar ‘N Cream cotton yarn, it comes in an array of beautiful colors, and it’s thick enough to protect your fingers from further burns. 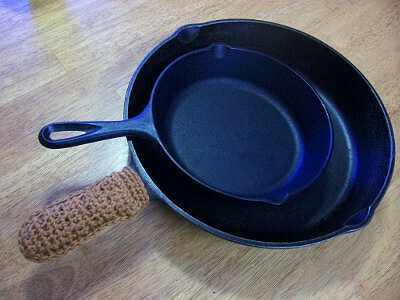 The Firefly Hook also has a great free pattern for pot handle cozies, which can be adjusted to fit any size handle. The pattern suggests using a yarn like Wool & The Gang’s Shiny Happy Cotton, along with a 5.5mm crochet hook and all of the following stitches: chain (ch), slip stitch (sl st), single crochet (sc) and double crochet (dc). This pattern is unique because it doubles up on the yarn to provide even more space between heated handles and fingers. If this sounds like something you need, try any of the above patterns for free from Rene Catron, She’s Crafty Crochet, and The Firefly Hook. And say goodbye to burnt fingers forever!